Image of a typical positron emission tomography (PET) facility. Positron emission tomography (PET) is a nuclear medicine imaging technique that produces a three-dimensional image or map of functional processes in the body. The system detects pairs of gamma rays emitted indirectly by a positron-emitting radionuclide (tracer), which is introduced into the body on a biologically active molecule. Images of tracer concentration in 3-dimensional space within the body are then reconstructed by computer analysis. In modern scanners, this reconstruction is often accomplished with the aid of a CT X-ray scan performed on the patient during the same session, in the same machine. If the biologically active molecule chosen for PET is FDG ([18F]-fluorodeoxyglucose), an analog of glucose, the concentrations of tracer imaged then give tissue metabolic activity, in terms of regional glucose uptake. This tracer is used in the most common type of PET scan, but other tracer molecules are also used in PET to image the tissue concentration of many other types of molecules of interest. The concept of emission and transmission tomography was introduced by David Kuhl and Roy Edwards in the late 1950s. Their work later led to the design and construction of several tomographic instruments at the University of Pennsylvania. Tomographic imaging techniques were further developed by Michel Ter-Pogossian, Michael E. Phelps, and coworkers at the Washington University School of Medicine. Beginning in the 1950s, the work of Gordon Brownell, Charles Burnham, and their colleagues at the Massachusetts General Hospital contributed significantly to the development of PET technology and included the first demonstration of annihilation radiation for medical imaging. Their innovations, including the use of light pipes, and volumetric analysis have been important in the deployment of PET imaging. In the 1970s, Tatsuo Ido at the Brookhaven National Laboratory was the first to describe the synthesis of 18F-FDG ([18F]-fluorodeoxyglucose), the most commonly used PET scanning isotope carrier. The compound was first administered to two normal human volunteers by Abass Alavi in August 1976 at the University of Pennsylvania. Brain images obtained with an ordinary (non-PET) nuclear scanner demonstrated the concentration of FDG in that organ. Later, the substance was used in dedicated positron tomographic scanners, to yield the modern procedure. To conduct the scan, a short-lived radioactive tracer isotope, is injected into the living subject (usually into blood circulation). The tracer is chemically incorporated into a biologically active molecule, and eventually decays, emitting a positron. There is a waiting period while the active molecule becomes concentrated in tissues of interest; then the research subject or patient is placed in the imaging scanner. The molecule most commonly used for this purpose is fluorodeoxyglucose (FDG), a sugar, for which the waiting period is typically an hour. As the radioisotope undergoes positron emission decay (also known as positive beta decay), it emits a positron, the antimatter counterpart of an electron. After traveling up to a few millimeters the positron encounters and annihilates with an electron, producing a pair of annihilation (gamma) photons moving in opposite directions. These are detected when they reach a scintillator material in the scanning device, creating a burst of light which is detected by photomultiplier tubes or silicon avalanche photodiodes (Si APD). The technique depends on simultaneous or coincident detection of the pair of photons; photons which do not arrive in pairs (that is, within a timing window of few nanoseconds) are ignored. The most significant fraction of electron-positron decays result in two 511 keV gamma photons being emitted at almost 180 degrees to each other; hence it is possible to localize their source along a straight line of coincidence (also called formally the line of response or LOR). In practice the LOR has a finite width as the emitted photons are not exactly 180 degrees apart. If the recovery time of detectors is in the picosecond range rather than the 10's of nanosecond range, it is possible to localize the event to a segment of a cord, whose length is determined by the detector timing resolution. As the timing resolution improves, the signal-to-noise ratio (SNR) of the image will improve, requiring less events to achieve the same image quality. This technology is not yet common, but it is available on some new systems. More commonly, a technique much like the reconstruction of computed tomography (CT) and single photon emission computed tomography (SPECT) data is used, although the data set collected in PET is much poorer than CT, so reconstruction techniques are more difficult (see Image reconstruction of PET). Using statistics collected from tens-of-thousands of coincidence events, a set of simultaneous equations for the total activity of each parcel of tissue along many LORs can be solved by a number of techniques, and thus a map of radioactivities as a function of location for parcels or bits of tissue (also called voxels), may be constructed and plotted. The resulting map shows the tissues in which the molecular probe has become concentrated, and can be interpreted by a nuclear medicine physician or radiologist in the context of the patient's diagnosis and treatment plan. PET scans are increasingly read alongside CT or magnetic resonance imaging (MRI) scans, the combination ("co-registration") giving both anatomic and metabolic information (that is, what the structure is, and what it is doing biochemically). Because PET imaging is most useful in combination with anatomical imaging, such as CT, modern PET scanners are now available with integrated high-end multi-detector-row CT scanners. Because the two scans can be performed in immediate sequence during the same session, with the patient not changing position between the two types of scans, the two sets of images are more-precisely registered, so that areas of abnormality on the PET imaging can be more perfectly correlated with anatomy on the CT images. This is very useful in showing detailed views of moving organs or structures with higher amounts of anatomical variation, such as are more likely to occur outside the brain. Radionuclides used in PET scanning are typically isotopes with short half lives such as carbon-11 (~20 min), nitrogen-13 (~10 min), oxygen-15 (~2 min), and fluorine-18 (~110 min). These radionuclides are incorporated either into compounds normally used by the body such as glucose (or glucose analogues), water or ammonia, or into molecules that bind to receptors or other sites of drug action. Such labelled compounds are known as radiotracers. It is important to recognize that PET technology can be used to trace the biologic pathway of any compound in living humans (and many other species as well), provided it can be radiolabeled with a PET isotope. Thus, the specific processes that can be probed with PET are virtually limitless, and radiotracers for new target molecules and processes are being synthesized all the time; as of this writing there are already dozens in clinical use and hundreds applied in research. Due to the short half lives of most radioisotopes, the radiotracers must be produced using a cyclotron and radiochemistry laboratory that are in close proximity to the PET imaging facility. The half life of fluorine-18 is long enough such that fluorine-18 labeled radiotracers can be manufactured commercially at an offsite location. The minimization of radiation dose to the subject is an attractive feature of the use of short-lived radionuclides. Besides its established role as a diagnostic technique, PET has an expanding role as a method to assess the response to therapy, in particular, cancer therapy, where the risk to the patient from lack of knowledge about disease progress is much greater than the risk from the test radiation. In practice, considerable pre-processing of the data is required—correction for random coincidences, estimation and subtraction of scattered photons, detector dead-time correction (after the detection of a photon, the detector must "cool down" again) and detector-sensitivity correction (for both inherent detector sensitivity and changes in sensitivity due to angle of incidence). 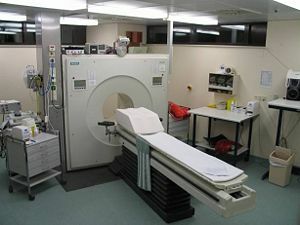 Alternative methods of scanning include x-ray computed tomography (CT), magnetic resonance imaging (MRI) and functional magnetic resonance imaging (fMRI), ultrasound, and single photon emission computed tomography (SPECT). While some imaging scans such as CT and MRI isolate organic anatomic changes in the body, PET and SPECT are capable of detecting areas of molecular biology detail (even prior to anatomic change). PET scanning does this using radiolabelled molecular probes that have different rates of uptake depending on the type and function of tissue involved. Changing of regional blood flow in various anatomic structures (as a measure of the injected positron emitter) can be visualized and relatively quantified with a PET scan. Oncology: PET scanning with the tracer fluorine-18 (F-18) fluorodeoxyglucose (FDG), called FDG-PET, is widely used in clinical oncology. This tracer is a glucose analog that is taken up by glucose-using cells and phosphorylated by hexokinase (whose mitochondrial form is greatly elevated in rapidly-growing malignant tumours). A typical dose of FDG used in an oncological scan is 200-400 MBq for an adult human. Because the oxygen atom which is replaced by F-18 to generate FDG is required for the next step in glucose metabolism in all cells, no further reactions occur in FDG. Furthermore, most tissues (with the notable exception of liver and kidneys) cannot remove the phosphate added by hexokinase. This means that FDG is trapped in any cell which takes it up, until it decays, since phosphorylated sugars, due to their ionic charge, cannot exit from the cell. This results in intense radiolabeling of tissues with high glucose uptake, such as the brain, the liver, and most cancers. As a result, FDG-PET can be used for diagnosis, staging, and monitoring treatment of cancers, particularly in Hodgkin's disease, non Hodgkin's lymphoma, and lung cancer. Many other types of solid tumors will be found to be very highly labeled on a case-by-case basis—a fact which becomes especially useful in searching for tumor metastasis, or for recurrence after a known highly-active primary tumor is removed. Because individual PET scans are more expensive than "conventional" imaging with computed tomography (CT) and magnetic resonance imaging (MRI), expansion of FDG-PET in cost-constrained health services will depend on proper health technology assessment; this problem is a difficult one because structural and functional imaging often cannot be directly compared, as they provide different information. Oncology scans using FDG make up over 90% of all PET scans in current practice. Neurology: PET neuroimaging is based on an assumption that areas of high radioactivity are associated with brain activity. What is actually measured indirectly is the flow of blood to different parts of the brain, which is generally believed to be correlated, and has been measured using the tracer oxygen-15. However, because of its 2-minute half-life O-15 must be piped directly from a medical cyclotron for such uses, and this is difficult. In practice, since the brain is normally a rapid user of glucose, and since brain pathologies such as Alzheimer's disease greatly decrease brain metabolism of both glucose and oxygen in tandem, standard FDG-PET of the brain, which measures regional glucose use, may also be successfully used to differentiate Alzheimer's disease from other dementing processes, and also to make early diagnosis of Alzheimer's disease. The advantage of FDG-PET for these uses is its much wider availability. PET imaging with FDG can also be used for localization of seizure focus: A seizure focus will appear as hypometabolic during an interictal scan. Several radiotracers (that is, radioligands) have been developed for PET that are ligands for specific neuroreceptor subtypes such as [11C] raclopride and [18F] fallypride for dopamine D2/D3 receptors, [11C]McN 5652 and [11C]DASB for serotonin transporters, or enzyme substrates (for example, 6-FDOPA for the AADC enzyme). These agents permit the visualization of neuroreceptor pools in the context of a plurality of neuropsychiatric and neurologic illnesses. A novel probe developed at the University of Pittsburgh termed PIB (Pittsburgh Compound-B) permits the visualization of amyloid plaques in the brains of Alzheimer's patients. This technology could assist clinicians in making a positive clinical diagnosis of AD pre-mortem and aid in the development of novel anti-amyloid therapies. Cardiology, atherosclerosis and vascular disease study: In clinical cardiology, FDG-PET can identify so-called "hibernating myocardium," but its cost-effectiveness in this role versus SPECT is unclear. Recently, a role has been suggested for FDG-PET imaging of atherosclerosis to detect patients at risk of stroke. Pharmacology: In pre-clinical trials, it is possible to radiolabel a new drug and inject it into animals. The uptake of the drug, the tissues in which it concentrates, and its eventual elimination, can be monitored far more quickly and cost effectively than the older technique of killing and dissecting the animals to discover the same information. A miniature PET tomograph has been constructed that is small enough for a fully conscious and mobile rat to wear on its head while walking around. This RatCAP (Rat Conscious Animal PET) allows animals to be scanned without the confounding effects of anesthesia. PET scanners for rats and non-human primates are marketed for this purpose. The technique is still generally too expensive for the veterinary medicine market, however, so very few pet PET scans are done. Drug occupancy at the purported site of action can also be inferred indirectly by competition studies between unlabeled drug and radiolabeled compounds known a priori to bind with specificity to the site. PET scanning is non-invasive, but it does involve exposure to ionizing radiation. The total dose of radiation is small, however, usually around 7 mSv. This can be compared to 2.2 mSv average annual background radiation in the UK, 0.02 mSv for a chest x-ray, up to 8 mSv for a CT scan of the chest, 2-6 mSv per annum for aircrew. Patients with small children may be advised to limit proximity to them for several hours following the completion of the test. ↑ M.M. Ter-Pogossian, et al., Positron-emission transaxial tomograph for nuclear imaging (PETT). Radiology 114 (1): 89-98. Retrieved October 9, 2008. ↑ M.E. Phelps, E.J. Hoffman, N.A. Mullani, and M.M. Ter-Pogossian, Application of annihilation coincidence detection to transaxial reconstruction tomography, Journal of Nuclear Medicine 16 (3): 210-224. PMID 1113170. ↑ W.H. Sweet and G.L. Brownell, Localization of brain tumors with positron emitters, Nucleonics 11: 40-45. ↑ News Release, June 15, 2006, Advancements in "Time-of-Flight" Technology Make New PET/CT Scanner at Penn a First in the World, Penn Medicine. Retrieved October 9, 2008. ↑ Lisa Fratt, Technology: Radiation Testing and PET Minding the Radiopharmaceutical Store, Medical Imaging. Retrieved October 9, 2008. ↑ J.H.F. Rudd, et al., Imaging Atherosclerotic Plaque Inflammation With (18F)-Fluorodeoxyglucose Positron Emission Tomography, Circulation 105: 2708-2711. Retrieved October 9, 2008. ↑ Brookhaven National Laboratory, Awake Animal PET Imaging with the Rat CAP (Rat Conscious Animal PET). Retrieved October 9, 2008. ↑ Data obtained from UK National Radiological Protection Board. Bailey, Dale L., et al. (eds.). 2005. Positron Emission Tomography: Basic Sciences. New York: Springer. ISBN 978-1852337988. Bustamante, E., and P.L. Pedersen. 1977. High aerobic glycolysis of rat hepatoma cells in culture: role of mitochondrial hexokinase. Proceedings of the National Academy of Sciences USA. 74 (9): 3735–3739. Klunk, W.E., et al. 2004. 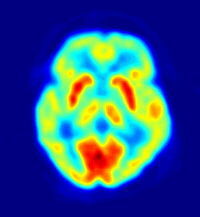 Imaging brain amyloid in Alzheimer's disease with Pittsburgh Compound-B. Annals of Neurology. 55 (3): 306–319. Kramer, Elissa L., et al. (eds.). 2008. Positron Emission Tomography Computed Tomography: A Disease-Oriented Approach. New York: Informa Healthcare. ISBN 978-0849380877. Valk, Peter E., et al. (eds.). 2006. Positron Emission Tomography: Clinical Practice. London: Springer. ISBN 978-1852339715. Kim, Su-Jin, et al. Seeing is believing: In vivo functional real-time imaging of transplanted islets using positron emission tomography (PET). Nature Protocols. The nuclear medicine and molecular medicine podcast. History of "Positron emission tomography"
This page was last modified on 26 May 2015, at 19:06.